The Hp Photosmart C4200 Seriesprinter consists of 11 specific products, which has similar functionality despite of having different model numbers. They also have the same reset procedure, which I will be post within a single page here. There are several issues the HP Photosmart C4200 Series may encounter. Below are a few common problems that can be fixed through resetting the unit. Wireless Printing Issue – If your photosmart c4200 series printer is not printeing wirelessly as expected, then you might have issues with the wireless settings on the printer. Unfortunately, changing wireless settings on this printer series is not that accessible. Some may only be accessed via software configuration, so you may have to reset everything and reinstall the hp printer software for everything to get loaded again. “No Wireless Printer Found” error message during Installation. Invalid IP address set on the printer – for some reason an invalid ip ( ie. 169.1.1.2 ) is set on the printer. A reset may be required to clear this out. 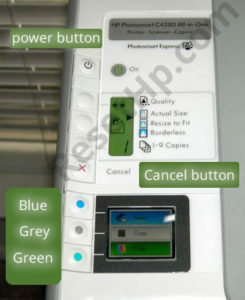 Slow printing – the printer becomes slow or unresponsive to print jobs sent from your computer. Ink Cartridge Problems – a message saying print cartridge is missing or damaged is displayed on your printer. Simultaneously Press and hold the “Cancel” and “Power” buttons. You will see a message asking you to enter a Special Key Combo. The combo key is to press the blue, green, grey buttons in the following order ( blue > green > gray). The “Support Menu” should now be visible. Go to the Resets menu you may use the the blue, green, and grey buttons to navigate left, right, and enter. There a Three types of resets available. Partial, Semi-full, and Full Reset. Each of this reset can be used for certain issues. If you just need to reset the printer into a responsive state, then you can use the partial reset. If it does not work, then you may use the semi or full reset. Note that these reset procedures will delete all the settings on your printer to factory defaults.